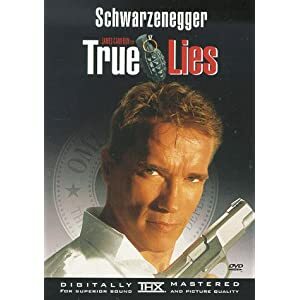 True Lies is a great action-comedy movie. Arnold Schwarzenegger is a 007 spy kind of guy with Tom Arnold as his partner. The two are extremely funny together. In the movie, Arnie uses the cover of a computer salesman and his wife Helen (Jamie Lee Curtis) is clueless about his real job. Superior dialog, a great cast, and direction from James Cameron make this a great movie. It's very funny, but it also has great action and any action junkie will love this film. This is one of my favorite films of all time.